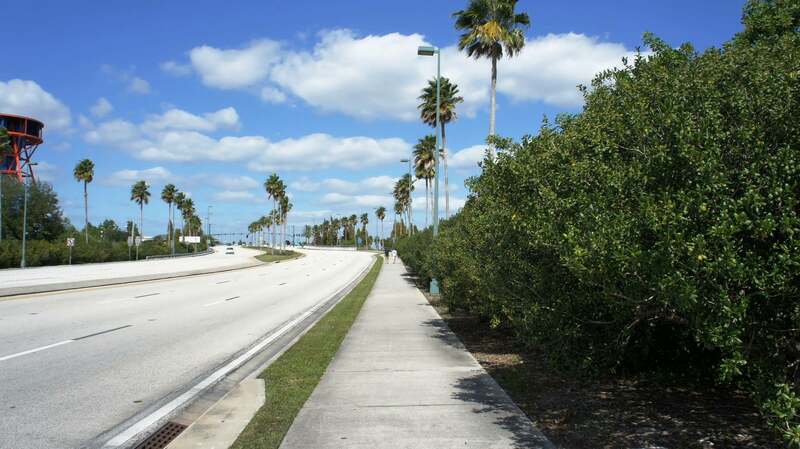 Walking path from the intersection of I-Drive and Universal Blvd to Universal CityWalk. There are two groups of hotels within walking distance of Universal Orlando Resort. One group is located on Major Blvd, across Kirkman Rd from the resort area. The second group is located along International Drive, across Interstate 4 from the resort. In this post we will be taking a closer look at exactly what it looks like to walk from the second group of hotels, the ones on International Drive (more commonly referred to as I-Drive), to Universal. We are starting our walk from the intersection of I-Drive and Universal Blvd. On the map above, this is where the bottom of the red line and the top of the purple line touch. This intersection is quite busy because, in addition to being a major part of the I-Drive tourist corridor, it is also home to the Wet ‘n Wild water park. Here is a quick video to help you get your bearings. Please note that the first portion of the video was shot from the southwest corner of the intersection; the second portion of the video was shot from the northeast corner. Now that we have our bearings, we can start the walk. Even though there is a bit of distance to cover (0.8 miles), this walk is incredibly simple. All you have to do is walk straight over the bridge crossing I-4 and on to the Universal’s transportation hub, and then into CityWalk. The path is very roomy, clean, well lit, and there is a concrete barrier between you and the traffic lanes as you cross over the bridge.